Some things should never happen. I know the trend lately is for potato chips to come out with strange, unique flavors (I'm looking at you, Lay's Cappuccino Flavored Potato Chips). I'm also never opposed to that in principle, because I've tasted some very awesome things that otherwise sounded disgusting. 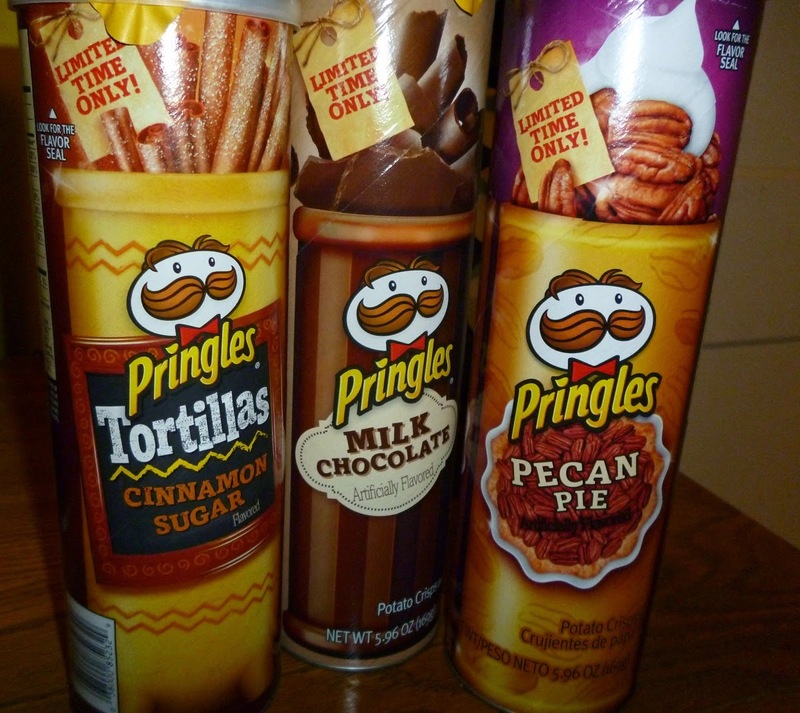 That said, let's take a look at some new Pringles flavors: Milk Chocolate, Pecan Pie, and Cinnamon Sugar. Pecan Pie: I don't care for pecan pie, so my expectations were low on this one. I was pleasantly surprised. The flavor is strong, but not overwhelmingly strong, and it does taste a lot like pecan pie. Unfortunately--since I don't like pecan pie--it didn't do much for me, but if you're the sort of person who likes to have a bowl of glazed sugar crammed full of stupid nuts then have at it. It's really good at what it does, I just don't like what it does. As much as Pecan Pie tastes like pecan pie, Milk Chocolate tastes nothing like milk chocolate. It almost tastes like a slightly sweet Pringle. It doesn't taste much like milk chocolate at all. At best, it's a slight aftertaste, but in either case I can't really recommend it for either chocolate lovers or Pringles lovers. I will admit that I cheated a bit. There was another flavor, White Chocolate, and I passed it over in favor of Cinnamon Sugar. I knew full well I was going to have White Chocolate, and in retrospect I'm sure it's not much different that the Milk Chocolate. Cinnamon Sugar is OK; they're tortilla chips, not potato chips, so it's a little different. They're not particularly strong, and this is the one flavor where it can afford to be a little strong. SO while they aren't bad there are other snacks out there that do cinnamon sugar a lot better. Sadly, I can't recommend any of these. Pecan Pie would probably be a decent choice for anyone who loves pecan pie, but I would pass on the other two.